Back Bay Books, 9780316354165, 320pp. "An especially good [novel]...about the things you believe in when you're young, and what breaks your heart along the way." —Refinery29, "One of the 2017 Books We're Most Excited About"
"[A] debut novel written by and for the literary millennial ... Pitoniak maintains her keen eye for the universal insecurities facing her generation today, from romantic uncertainties and the relative benefits and downsides of hedge fund and nonprofit jobs to the emotional effort it requires to negotiate the predetermined facts of one's upbringing with the person one chooses to become. "—Harper's Bazaar, "13 Books You Need to Read in January"
"Pitoniak's debut focuses on that time of life that is at turns both exhilarating and terrifying: right after getting out of college, when you're forced to confront who you are and who you want to be, when you know life is just beginning, but you're also starting to feel like many of your options are fading away. "—Nylon, "Best New Books of 2017"
"Following in the footsteps of classic debut novels like Rona Jaffe's The Best of Everything and Jay McInerney's Bright Lights, Big City, Pitoniak charts a tumultuous period in New York City history that transforms a group of recent college grads in ways they never anticipated. As in Kristopher Jansma's latest, Why We Came to the City, also set in the heady days of 2008, Pitoniak's ingenuous youths are helpless against the risk and potential they perceive lurking around each corner." 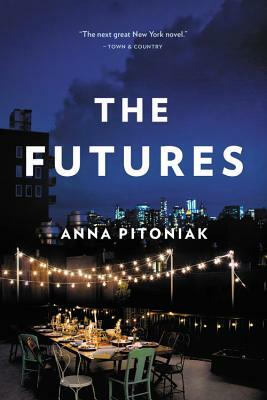 "The Futures stands out for its beautiful writing, emotional depth and evocative feel." "St. Elmo's Fire for millennials."